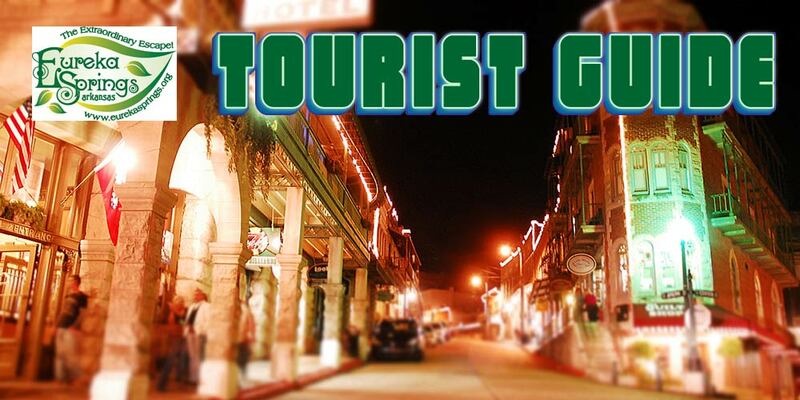 Located on the edge of Eureka Springs, a village where endless surprises abound. 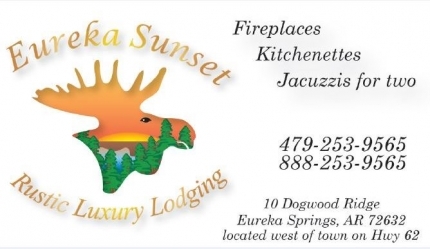 It is there, just minutes from the heart of downtown that you will find Eureka Sunset Cabins. Look, and you’ll see the quaint Cottage Style Rooms, each with its own personal entrance. The uniquely designed quality Cabins, with all of their custom charm, are nestled on six wooded acres right in the village itself. Imagine driving into a beautiful forest of rustic elegant lodging where nature surrounds you with its beauty, where birds are chirping, deer are galloping, and squirrels run and play. It’s a peaceful, private and romantic place to get-a-way. Privacy leads to serenity, and you’ll find it in abundance there. They’ll never impose. In fact, the accommodations are designed to be self-sufficient, from a variety of kitchens, to stacked washer-dryers in some of the cabins. If you choose, you may check in and count on never being disturbed until you leave, and, your stay is even more special with little touches like fresh coffee beans and microwave popcorn. You’ll delight in the focus on a smoke-free privacy. A smoking area is provided with each cottage style room and cabin on the back deck overlooking the Eureka Springs woods. Prices range from $129 to $169 per night for double occupancy. Please view their website and individual cabin and room pages for more information. The cabin was very clean. Comfortable place to stay. Bed very comfy. We stayed at the “Reel em in” Cabin. The place was decorated with a fishing theme. Jacuzzi was huge and very clean. Felt like a 2nd home. Cooked out on gas grill. Everything you needed was available. Peaceful environment! Friendly front desk. Convenient location. We stayed in the Chocolate Moose cabin and loved how beautifully decorated it is, and how quiet and peaceful the surroundings are. It's close to everything but also surrounded by woods. The fireplace and hot tub are great for relaxing, and we loved the helpful book of restaurant suggestions as well. Eureka Sunset is absolutely wonderful. This was our third time staying there and we are looking forward to the next time we can get away. 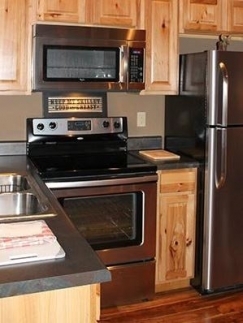 Becky is an amazing hostess, the cabins are comfortable and spotless, and the privacy cannot be beat! It is the perfect getaway! !